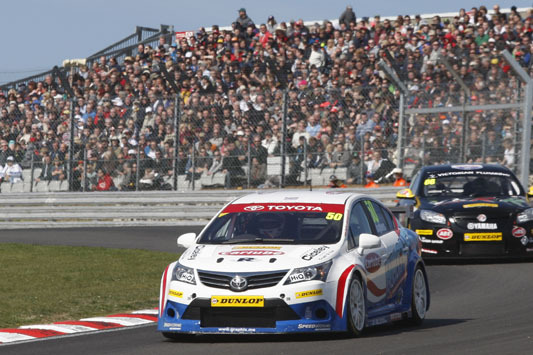 Toyota’s trio of independent BTCC racers endured a rollercoaster ride of mixed fortune at Brands Hatch today, accidents and mechanical mishaps marring what had promised to be a promising start to their Dunlop MSA British Touring Car Championship campaigns. 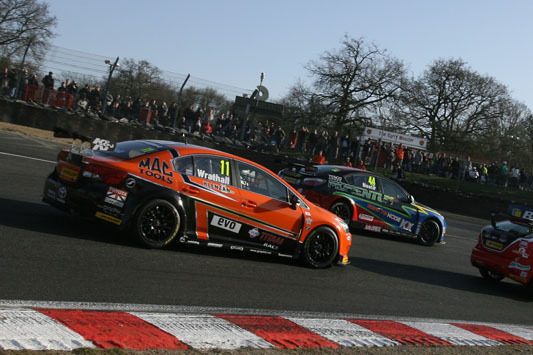 However, through the drama came Frank Wrathall to score his first points of the season for the Dynojet Racing team, with Speedworks Motorsport Avensis pilot Tony Hughes claiming his first-ever championship point. Unfortunately the championship’s newest recruit, Adam Morgan, had nothing to show for his fine efforts but a severely damaged car. Saturday’s qualifying session went well, with 25-year-old Wrathall an impressive eighth fastest in his brand new and largely unsorted Toyota, and Morgan an excellent 13th. The Dynojet Racing crew had toiled until 4am in the Brands Hatch pits to ready the car for its competition debut. Though promising, the new Toyota’s race debut was brief, with a gearbox problem after a couple of laps forcing Frank to retire to the pits. “Third gear broke up,” he said. “It’s something that has never happened before, and who could have predicted it? It’s a shame because that was probably my best-ever BTCC start. I got off the line well and in the first couple of corners was battling through… I was in quite a good position, then it started vibrating and when I hit third gear it just exploded.” Unfortunately the mechanical damage done necessitated a complete gearbox change, and that meant Wrathall had to sit out race two while the work was completed. He could consider himself lucky compared with Morgan, however. The Ribchester racer, 23, learned the hard way about life in the BTCC, with his debut outing in the Ginetta-backed Speedworks Toyota lasting only as far as the first corner at Brands Hatch. 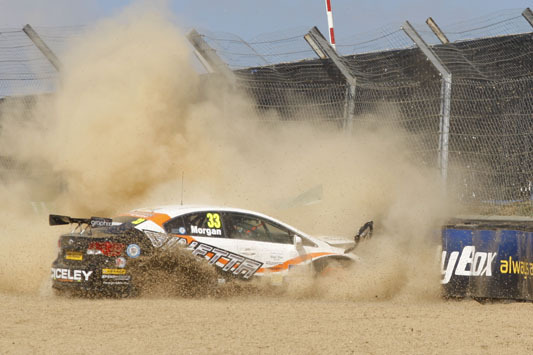 “My initiation into touring cars – about 300 metres, I think it was,” said Adam, who was tapped from behind by the MG of Andy Neate, which in turn had been hit by another. “I got an OK start and was heading for Paddock Hill Bend and the next thing I know I get a smack on my left hand door and I’m heading for the wall… We were three abreast into Paddock and I don’t think the guy on the outside saw me; it was a chain reaction thing.” Morgan also was an enforced spectator in race two. Morgan’s Speedworks team-mate Hughes fared better. Cheshire-based Tony, 54, sped from 21st on the grid to 16th in race one and placed 16th again as the sole Toyota representative in race two. He professed himself pleased with the way his car was handling after winter works to its balance, but less happy with the amount of power his new-spec Swindon TOCA engine was producing. 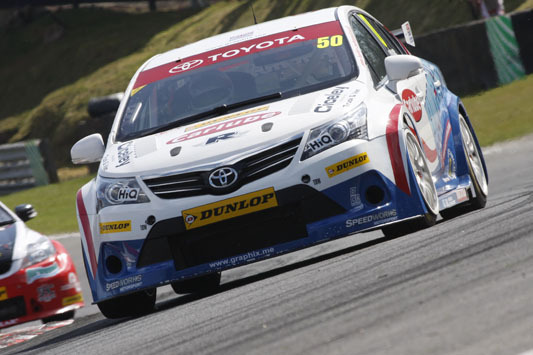 Donington Park in a fortnight’s time (15 Apr) holds the promise of better things for all three Toyota independents.